Sisana’s natural agave syrup is a 100% plants based, which extracted from various agave plants in Mexico and combined with cane sugar juice. It is consider as a high in fructose but low in Glycemic sweetener. Sisana natural agave syrup is sold in light color and in six flavors: Natural, Caramel, Maple, Honey, Vanilla and Chocolate flavors. The natural syrup has a neutral flavor and it is ideal for sweetening food, such as cereal, baked goods without losing its own distinctive flavor. 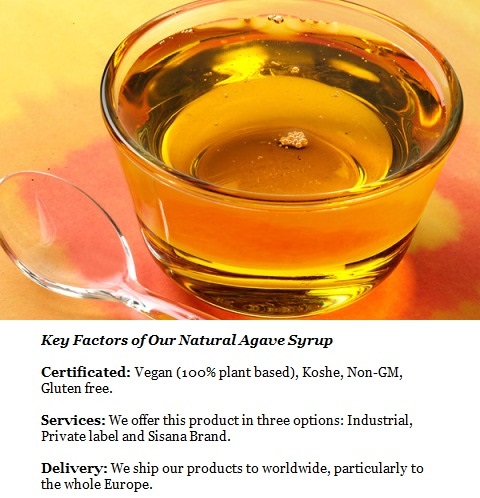 As well, our natural agave syrup is also an ideal option to enrich the flavor of drinks, such as tea, coffee, cocktails, lemonade, and more. Our natural agave syrup will always stays at its natural amber color and it will never got harden or crystallized. Click here to find more of our agave products. Our sales representatives are more than happy to answer all your questions. Call us at +31(0)20 23 803 00 or send us an email. At Sisana, we offer five different options to our customers for industrial purchasing: Gallon bottles, Pails, Canisters, Barrel containers and container – Totes. Besides having various of industrial options, we also offer our light agave syrup in alternatives private label to our customers: Tucan, Gecko, Jaguar and Komodo bottles. These private label options are popular in the market as they contain the proper amount of agave syrup for certain application purposes. Moreover, they enable our customers to sell the agave syrup under their own brands’ names. We add refine sugar to foods and beverages, such as using sugars to sweeten cakes and cookies, coffee, cereal and even fruit to improve the taste. However, anything that seriously satisfies our sweet tooth isn’t going to be the epitome of a healthy meal. Fortunately, Sisana will be able to provide you the ideal substitutes which will add more health benefits to your consumers. Sisana’s syrup with a range of customer favored flavors will be ideal options in healthy foods manufacturing and in beverages applications. We periodically employ top-rate European food analysis Laboratories, and our Supply Chain Control program assures that every ingredient and material, meets the requirements of our customers. Our full list of certifications can be found here. We provide extremely competitive prices and our agave is high value. We ship all over Europe, and deliver at high speed and at short notice. We deliver in many different sizes, to offer the most competitive price. Agave nectar is 1.4 times sweeter than refined sugar, which allows you to add less to achieve the same sweetness. It has a low Glycemic Index (of 39 or less), meaning that its carbohydrates are broken down and released more slowly, removing energy spikes. Learn more on types of Agave nectar here. And, there is more information here on the glycemic index of Agave nectar and other sweetener. Agave syrup is an excellent ingredient to be used in food and drink production, since it is highly soluble at lower temperatures, and taste great in most foods. It can be used to make an incredible number of food and drink items, including, beers, cocktails, smoothies, cold beverages, maple syrup. It is also a vegan substitute for honey, and can be used pretty much anywhere a common tabletop sugar would be used. The natural form is cost-effective and suits industrial use. For Agave Syrup common uses, see here: Uses of Agave Syrup. Below is an example of Agave Nutritional Information, which can vary slightly depending on which type of agave and the source. More in depth nutritional information on agave nectar can be found here. 1. Is agave nectar the same as agave syrup? Yes, agave nectar is the same as agave syrup. They are different terms for the same substance. 2. Is agave nectar gluten free? Yes, agave nectar is generally gluten free and can be safe to consume for those intolerant to gluten. 3. How long does agave nectar last? 2 years from the date it is packed. 4. Is agave nectar safe for diabetics? Agave syrup has a lower glycemic index than traditional sugar and is therefore broken down and released into the blood stream more slowly. However, we recommend consult your doctor before consuming this product. Interested in buying our products in bulk? Our sales representatives are more than happy to answer all your questions. Call us at +31(0)20 23 803 00 or send us an email. Contact Us!